All week long I’ve been watching the models from NOAA (and marveling what groups like Storm Pulse can do with them) with a little bit of dread. 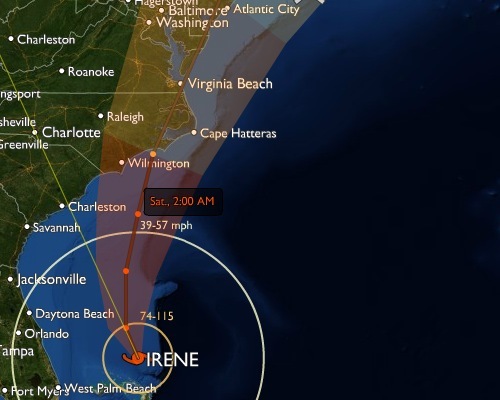 While Irene does not look like it will directly hit the District, the storm is 580 miles wide, and that means there’s a broad swath of the area that’s going to get slammed by high winds, a bunch of rain, and a storm surge in the Chesapeake that will backup into the Potomac and Anacostia watersheds. The storm is likely to arrive starting Saturday in the late morning, and last through the night into Sunday. Ocean City has been ordered to evacuate, and much of the Delmarva Peninsula looks to get hit the worst, and coastal flooding along the Potomac looks like a certainty. Rainfall totals in the District, as of late yesterday, were slated in the 1/2″ to 4″ range, depending on location, with the peninsula looking for totals well above that. First up: get ready for power outages. During Hurricane Isabel in 2003, parts of Arlington were without power for more than a week after the storm drove through the area. That means having a good radio (battery- or crank-powered, natch), and a flashlight or two, plus candles for light. In a lot of cases, gas stove igniters are electric, so make sure you’ve got a bic or some matches. If the power does go out, that means your fridge is out, too. Keep the fridge shut as much as possible with the power outage, but if things go longer than 12-18 hours, start eating, folks, or get some dry ice from the bodega, assuming they have power. Secondly: keep an eye on the local news. WIth the storm coming over a weekend, there’s less chance for disruptions in services, as we’ll all be sheltering at home. The winds are nothing to monkey with, though, so in the midst of the storm, don’t go running outside unless you absolutely have to. Winds over 50mph is nothing to mess with, they’re dangerous, and they pick things up and fling them about willy-nilly. That means if you have a balcony or a yard, now’s the time to bring it all inside. Yes, your place just got more crowded, but at least this way your stuff won’t hit someone else. Third up: Storm surge. That means water levels in the area can go up by 5-10 feet, which means low places like basements start to get a bit damp. If you live in an English basement, or have one, make sure your sump pump is running, and if necessary get some buckets and get ready to bail. In case this wasn’t totally clear: you want to be nowhere near the large moving bodies of water. Fifth: Check on your friends. Storms are a great time to stay in touch. Check in with your friends and make sure they’re okay. If you’ve got power and they don’t, and your couch isn’t already someone’s bed, for God’s sake invite them over. Nothing gets you through a storm better than a good buddy. that’s it for the washington monument. this time it will fall.